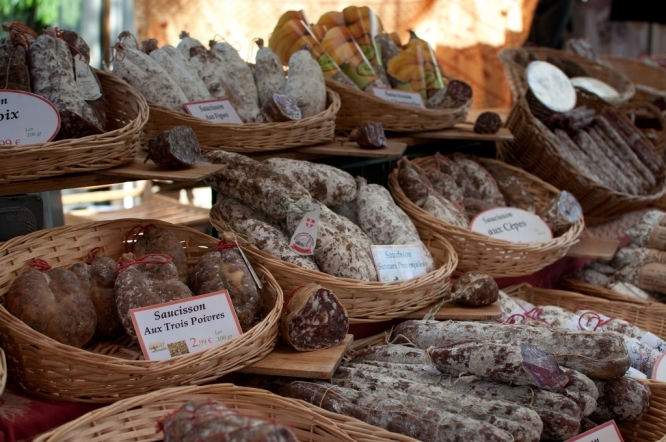 The competition, called the Mondial Rabelais de Saucisson, is taking place this weekend (June 9-10) in the small Ardèche village of Vanosc (Auvergne-Rhône-Alpes). Saucisson is the French name for the much-loved, cured sausage charcuterie, which comes in a wide variety of flavours and styles. Most often, it is favoured in its original “nature” state, but is also extremely popular when made with cheese, a black pepper rind, mushrooms, or even with chilli. The 2018 inaugural contest has brought together 80 varieties of saucisson, including from across France and Europe, and as far away as California and Canada. Modelling the contest on similar events for wine, the organisers have sought to “reward the best producers and consumers”, and have drawn up a meticulous tasting scoreboard to help the jury decide which saucisson is worthy of the top prize. Jury panelists include members of the Academie Ardèchoise des Amateurs de Saucisson. There will be points awarded for smell, texture and taste; as well as traceability and origin of the meat used; and the nutritional profile of the saucisson, as well as more complex factors such as the physico-chemical makeup of the product. Vanosc was chosen for its own charcuterie tradition; despite his baking-related surname, Vanosc mayor Yves Boulanger’s father and brother are both charcutiers. Mr Boulanger is expected to be present to help award the prizes this afternoon (Sunday June 10), with the prize-giving ceremony due to begin at 17h.